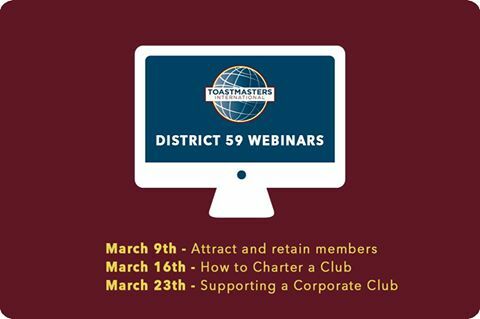 During March 2017 our District, through the Club Growth Director, has organized three webinars focusing on areas where members have requested support. Please find below the dates and links. You don’t need to enroll, just access the link 5 minutes before and attend the session. We recommend you test your PC/Laptop/Smartphone in order to be ready and enjoy the session. Feel free to send previously any question you want answered to cgd@district59.org.